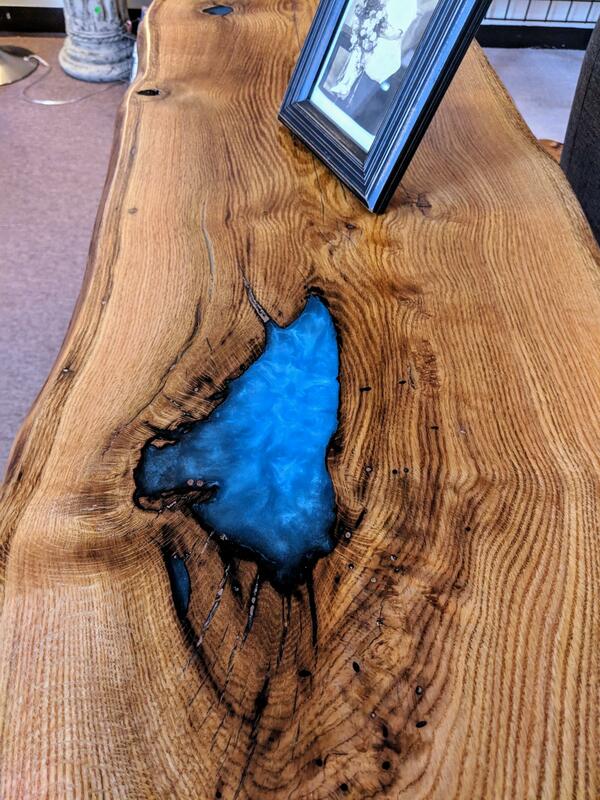 Looking at this slab with several holes in it, we could have thrown this in the burn pile. 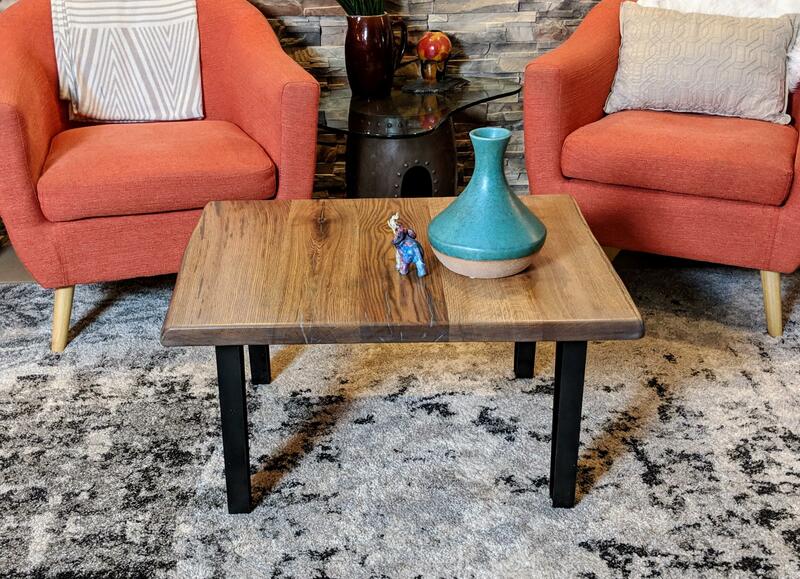 Instead we added a touch of sky that we're all longing for... and now it's a keeper. 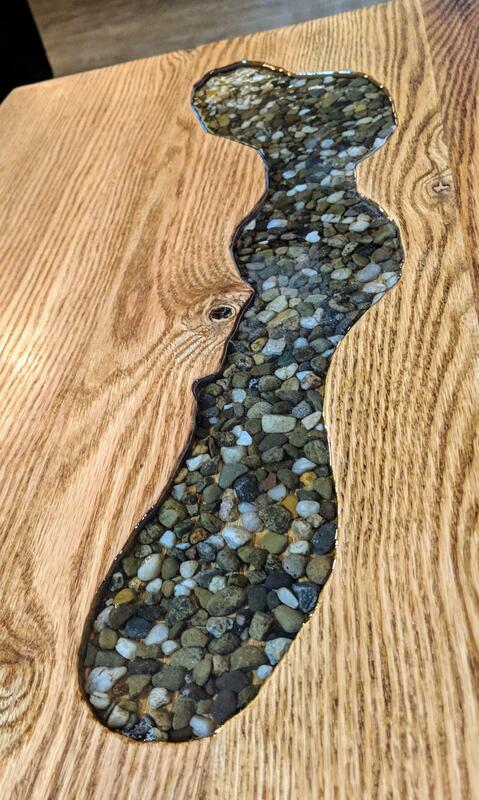 The double live edges seal the deal. 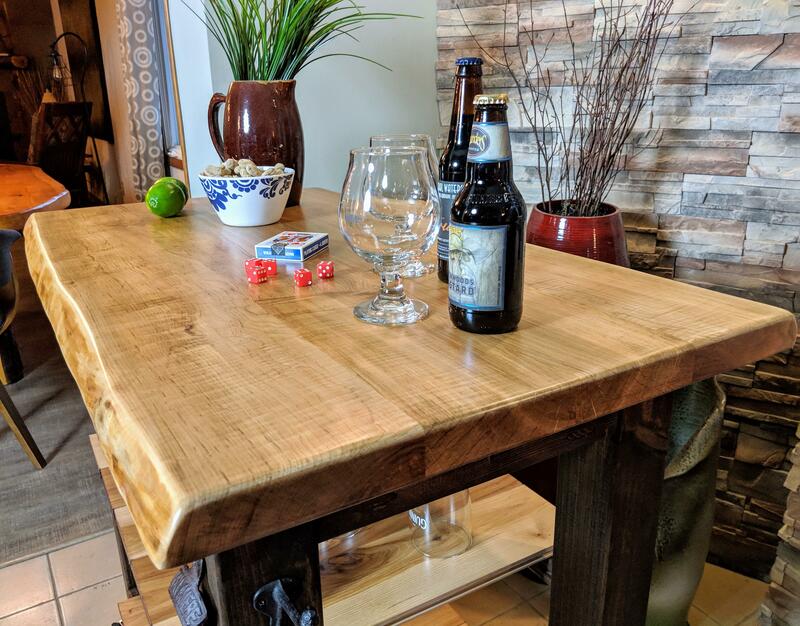 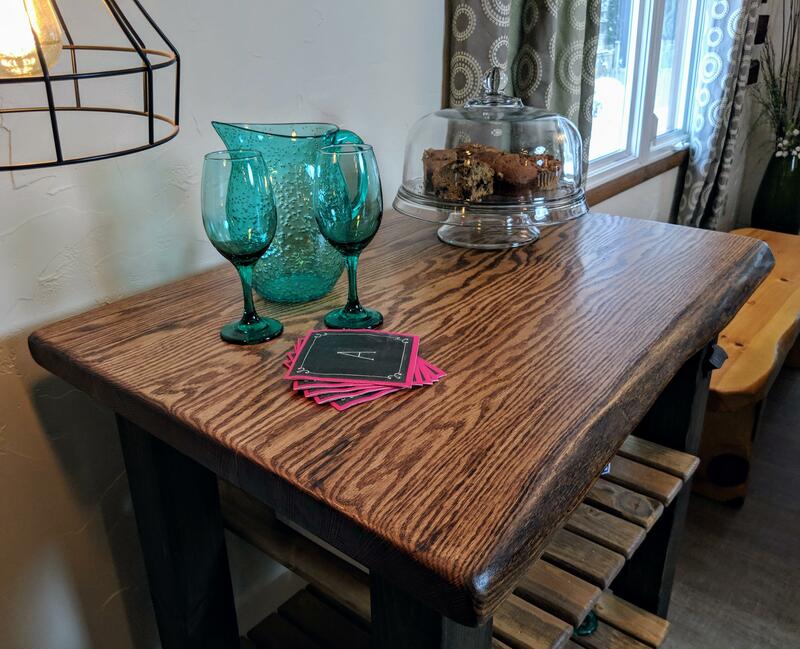 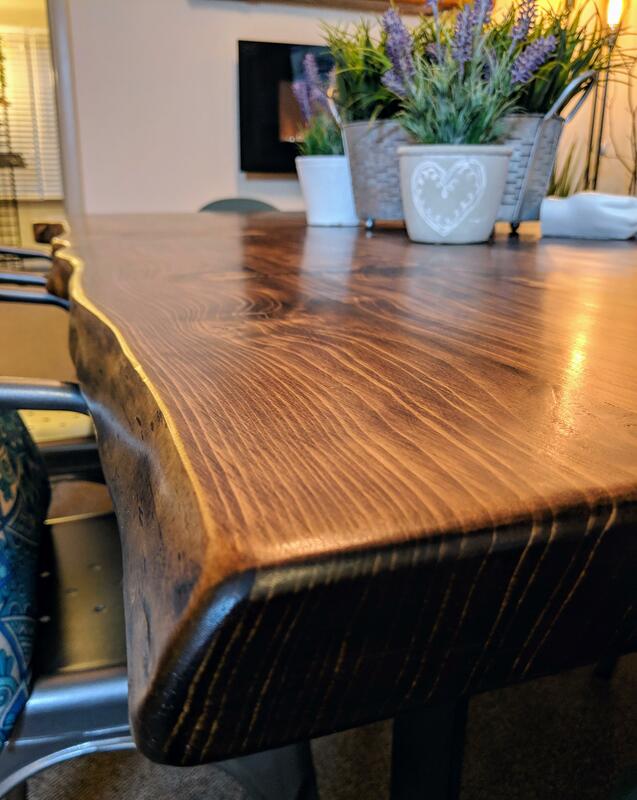 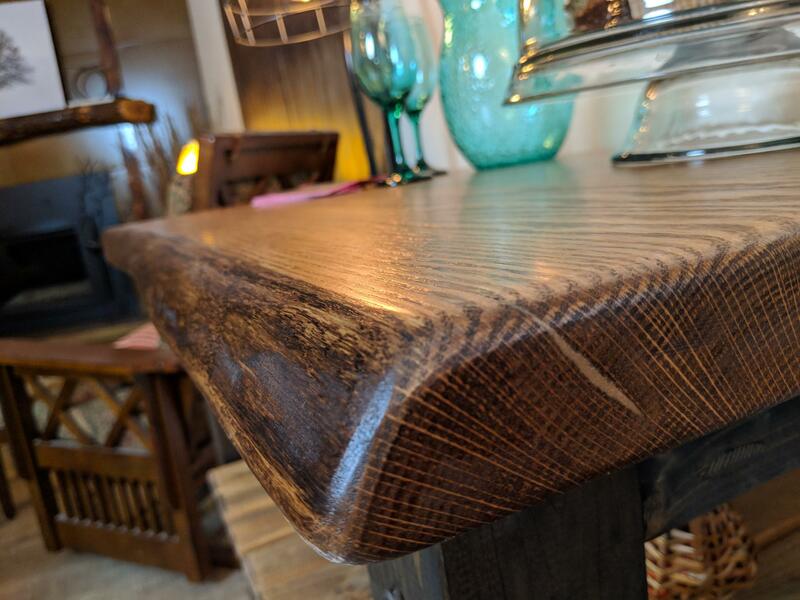 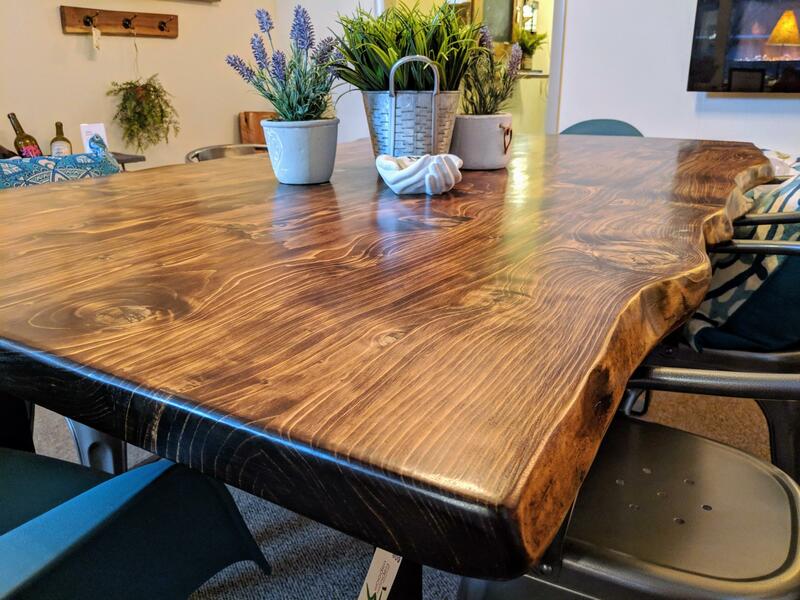 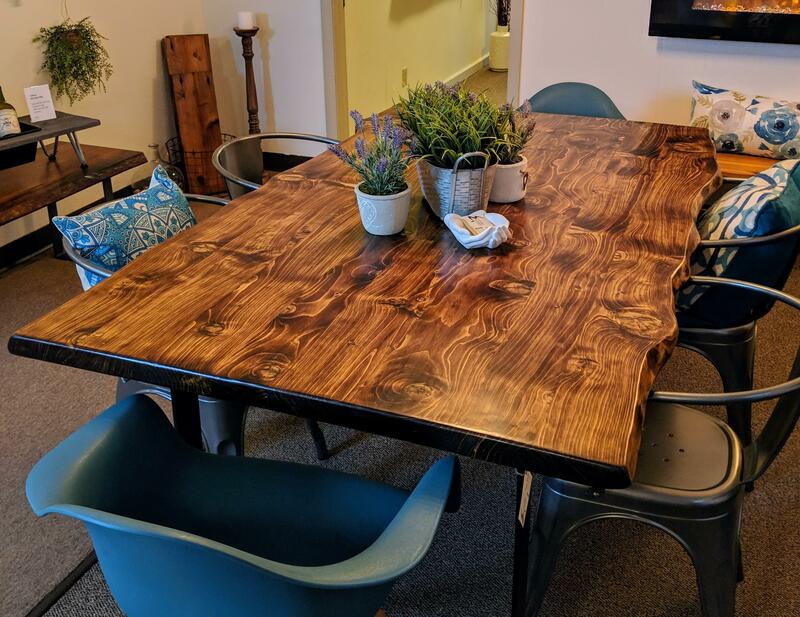 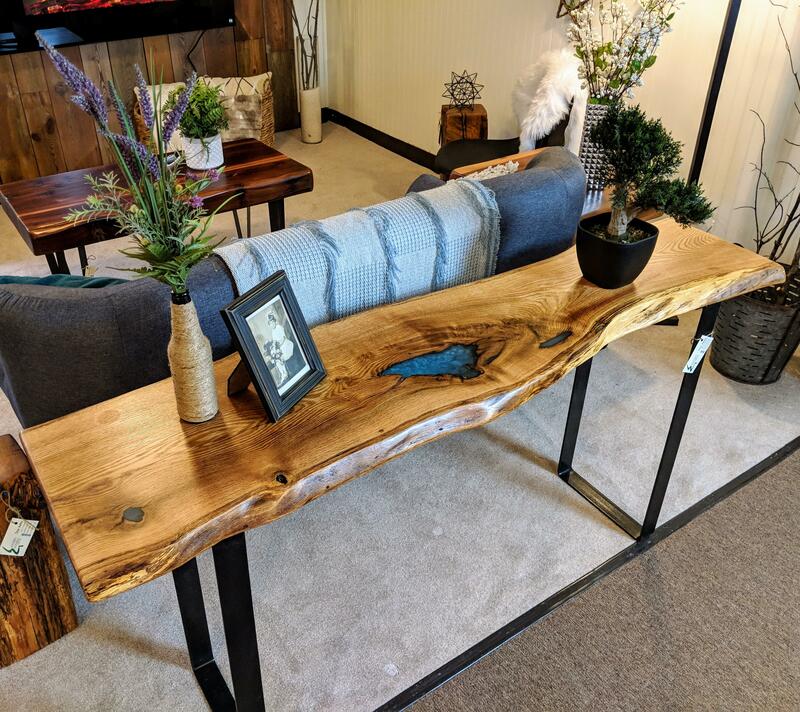 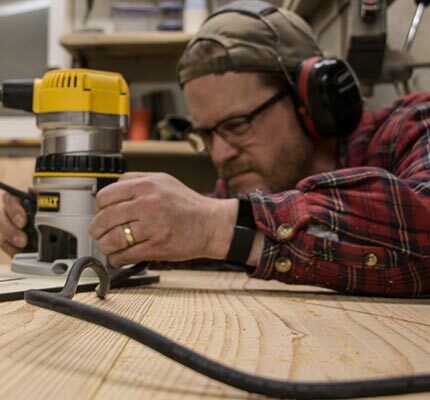 22" x 42" x 36"
Go big or go home--it's sometimes appropriate to put it all out there--and that's exactly what we've done in creating this double live edge spruce table. 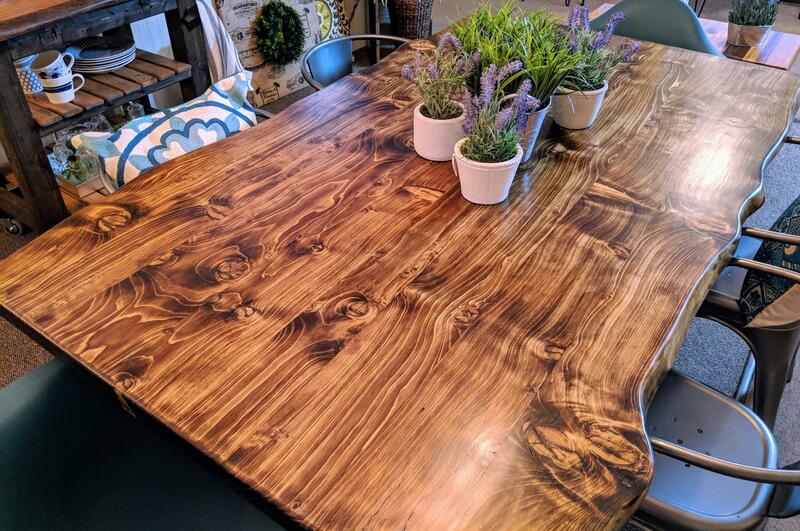 Sourced right here in Plover, WI, and dried in our own kiln, we were amazed to discover the uncommon movement in these slabs, so we accentuated the graining with a dark walnut stain. 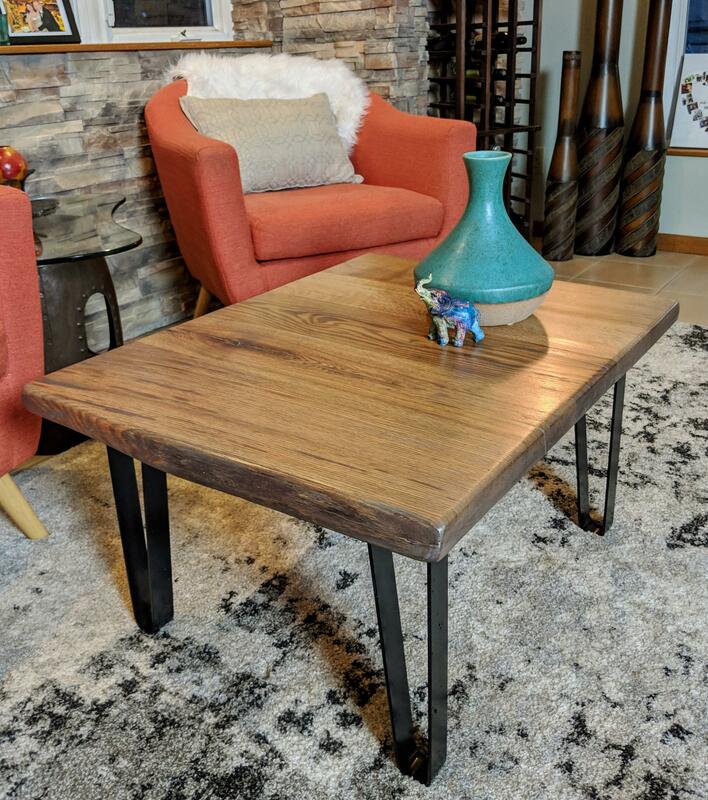 Placed on top of substantial 3" flat bar legs, this table truly makes a statement. 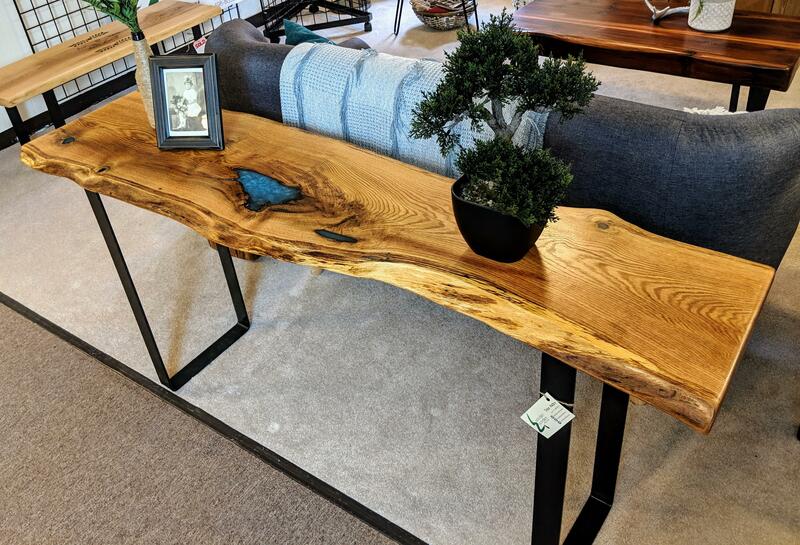 Check it out in our showroom! 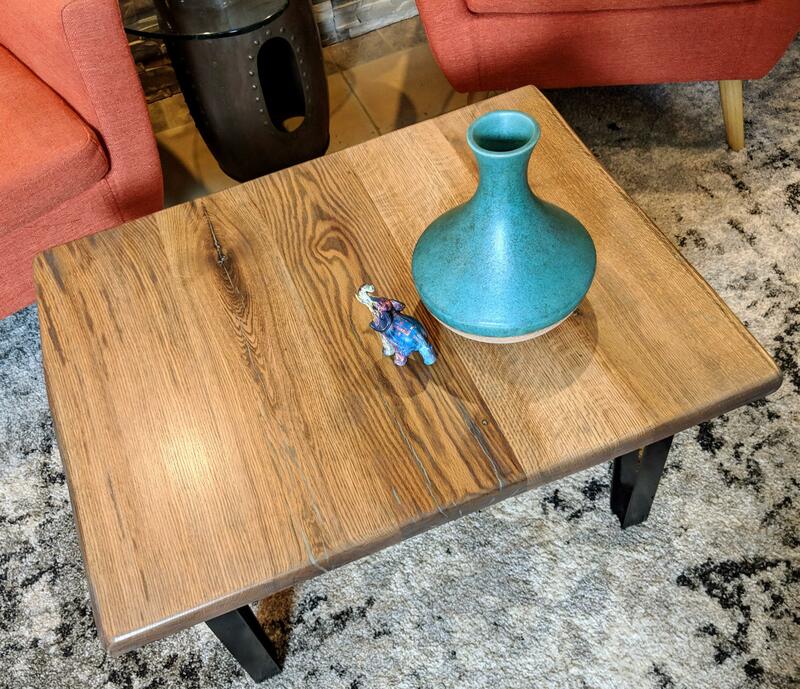 This oak coffee table brushes your room with nature, calmly and with purpose, sized to fit 'most anywhere. 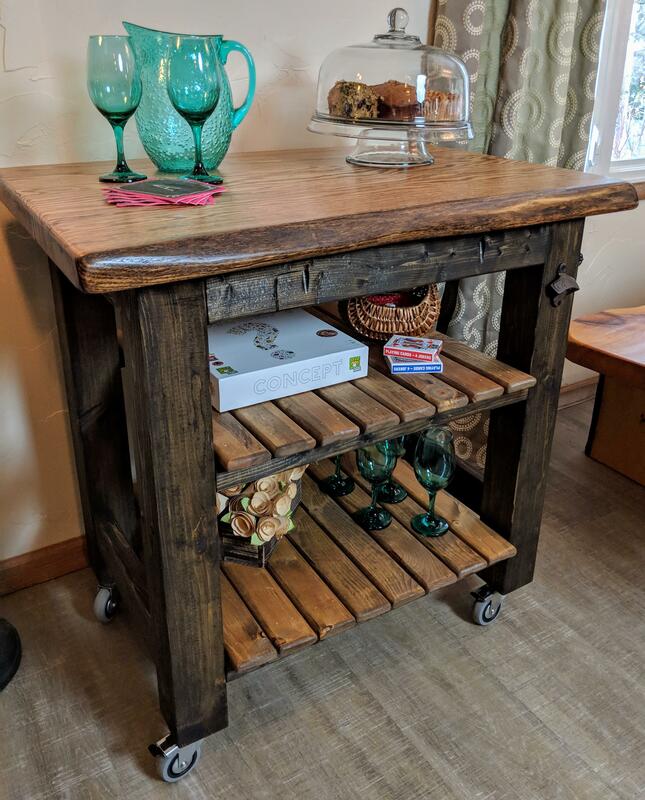 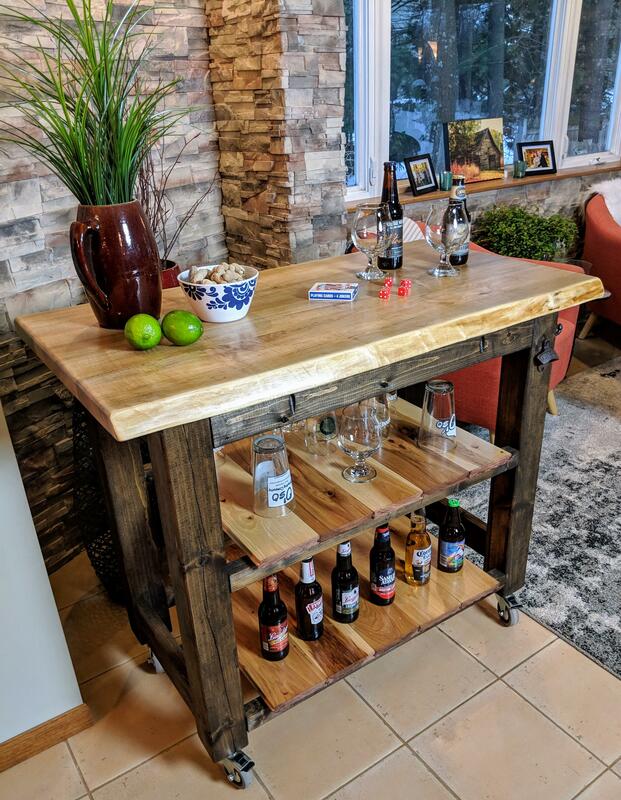 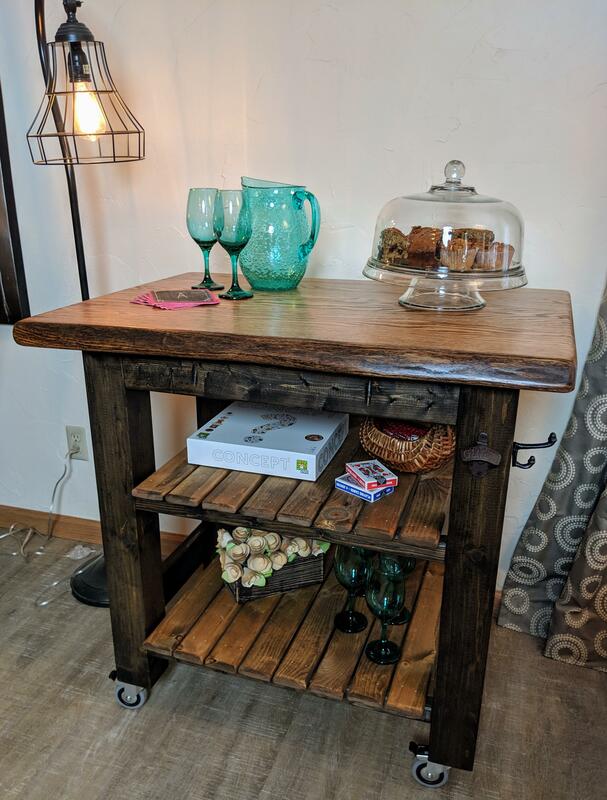 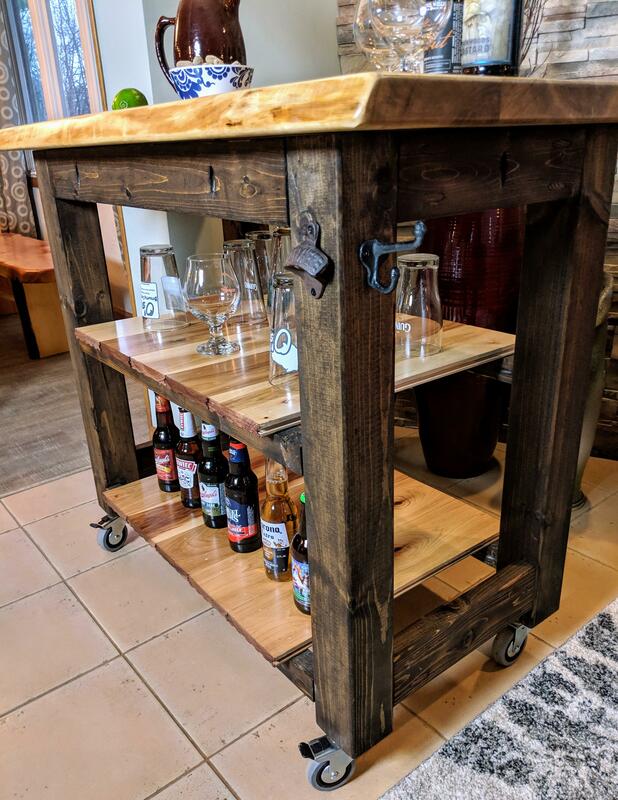 30" x 24" x 16"
Created as a surprise for a son and his wife by his parents, this beverage cart will fit the bill in a variety of settings. 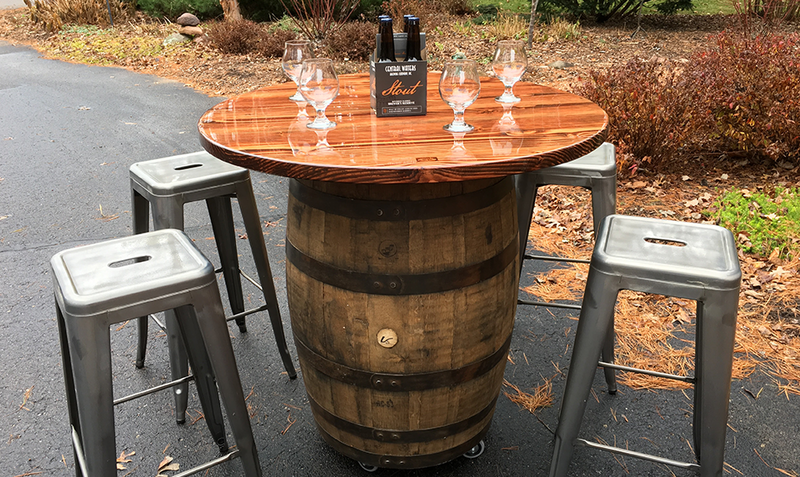 Great for game night; perfect for hosting hockey get-togethers; don't forget about wine-tastings! 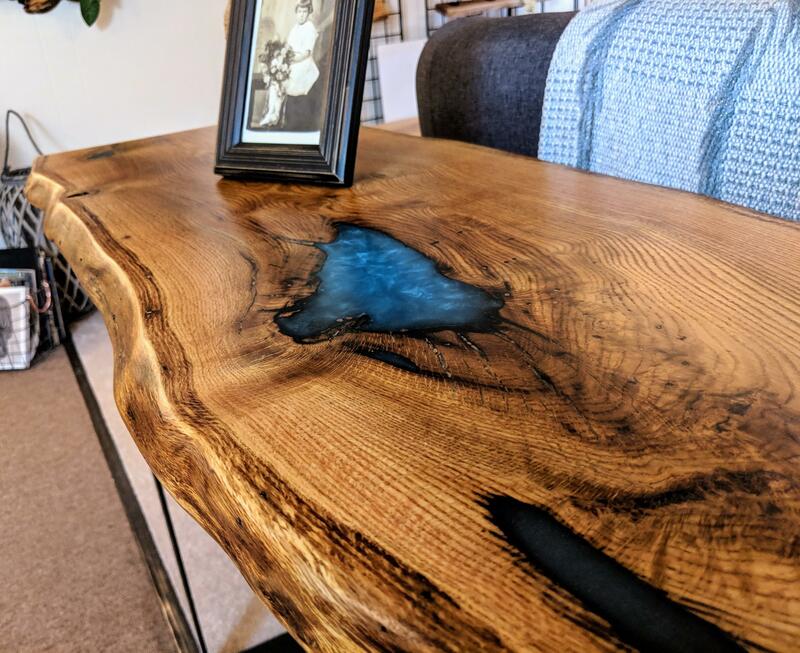 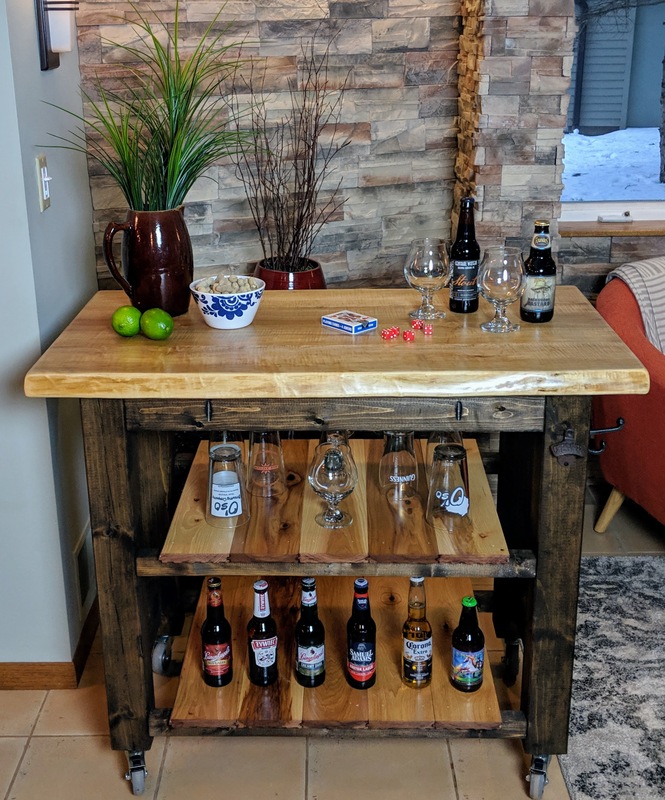 Oak slab top is from a farm in Plover, WI, dried in our own kiln. 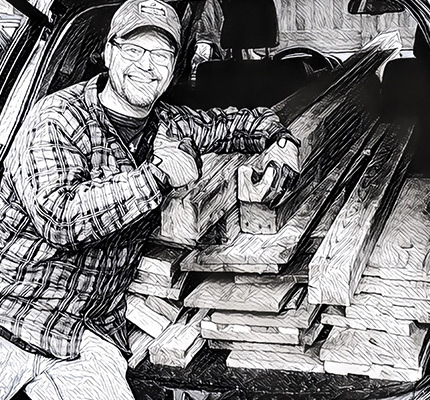 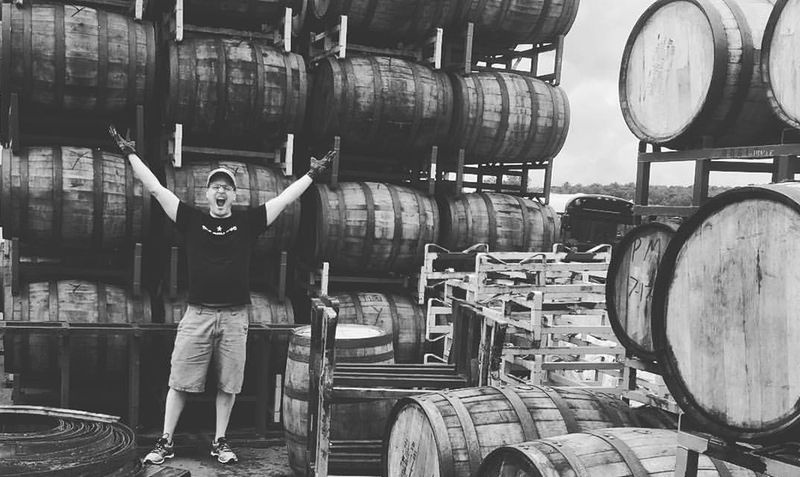 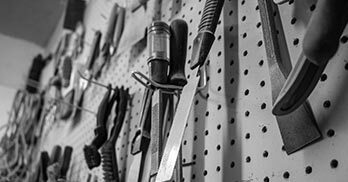 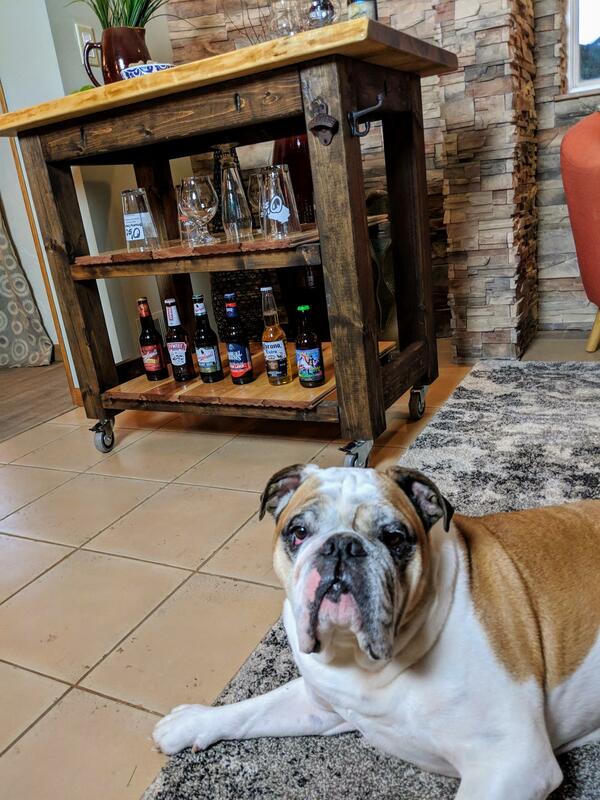 Come take a tour of our wood warehouse and choose the wood we'll use to create a piece just for you! 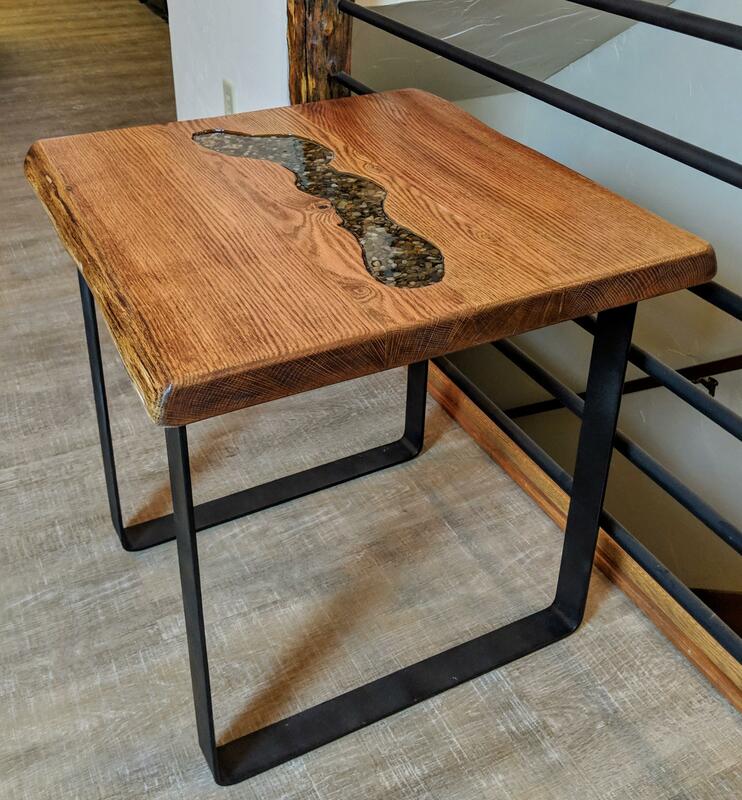 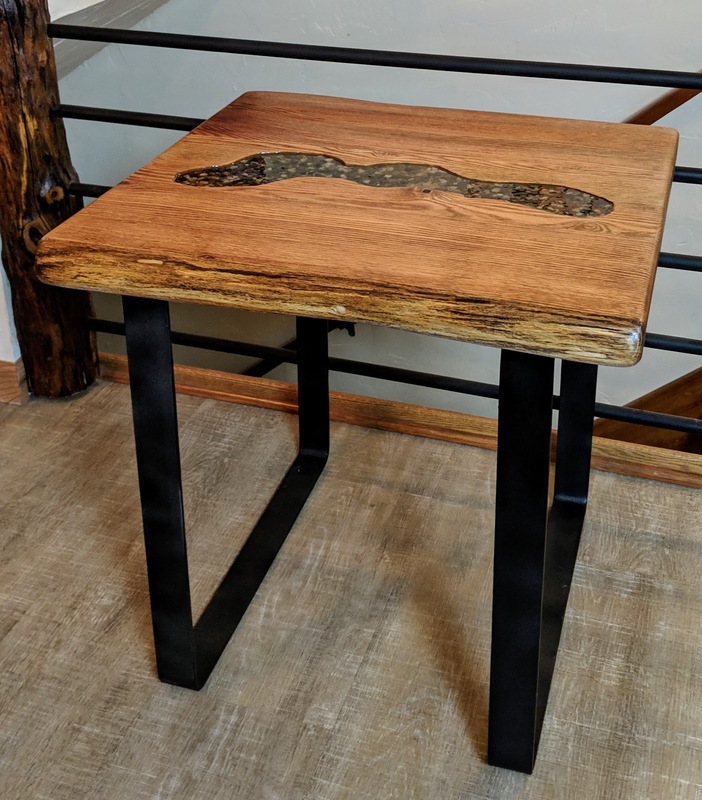 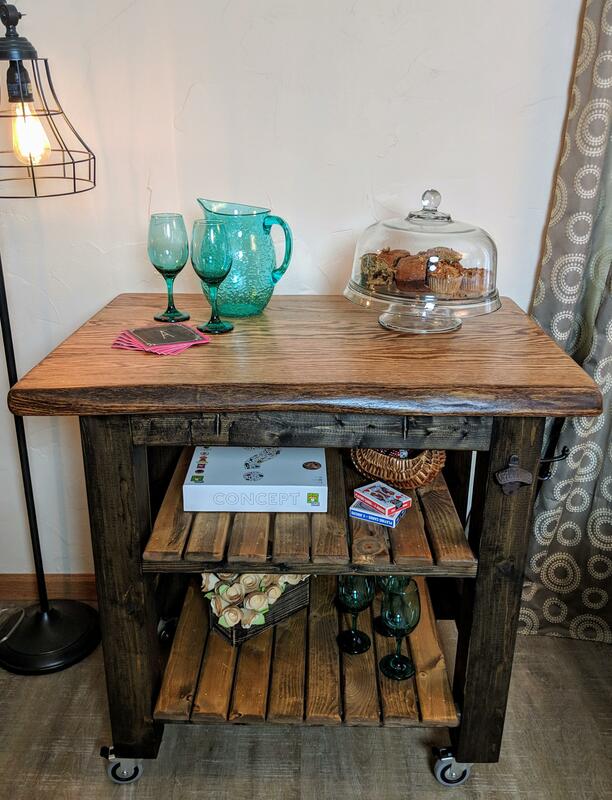 36" x 24" x 36"
Sitting at the edge of the river, gazing at the rocks below--recapture that feeling with this oak end table, sized to stand out. 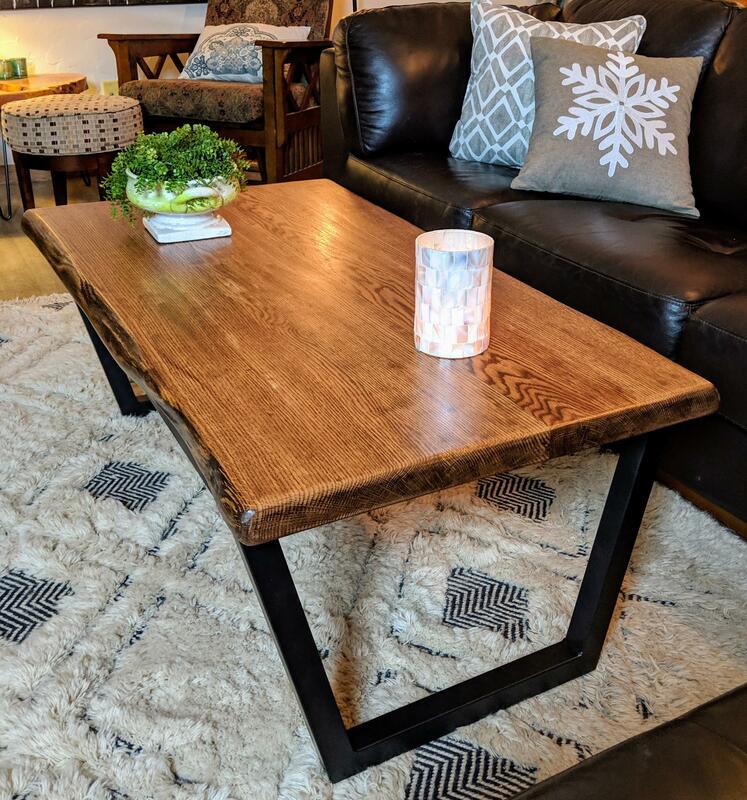 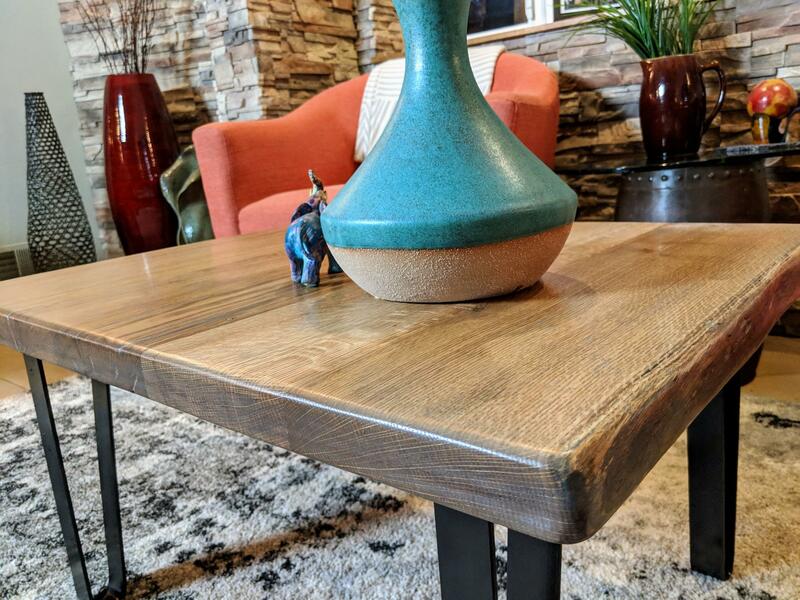 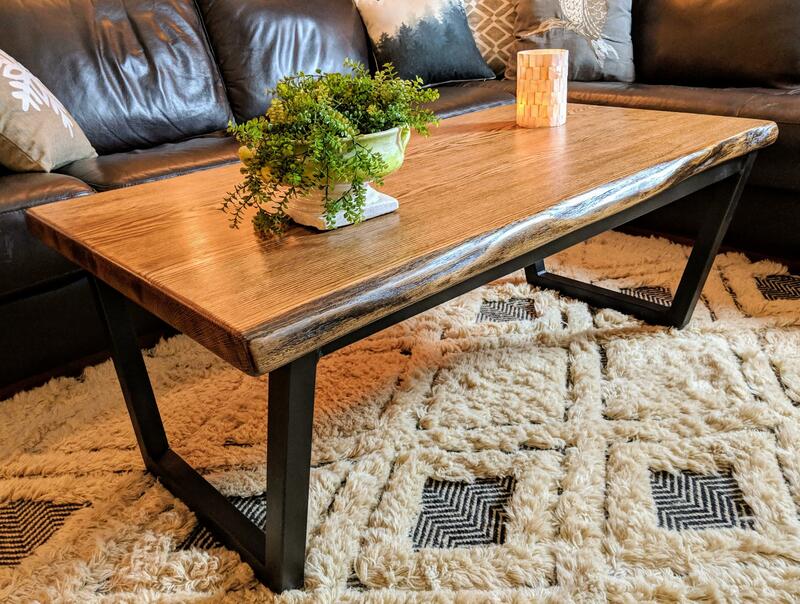 23.5" x 23" x 24"
Starting with a double live edge oak slab top and ending with a client-inspired inverted trapezoid base, this custom coffee table delivers understated style with ease. 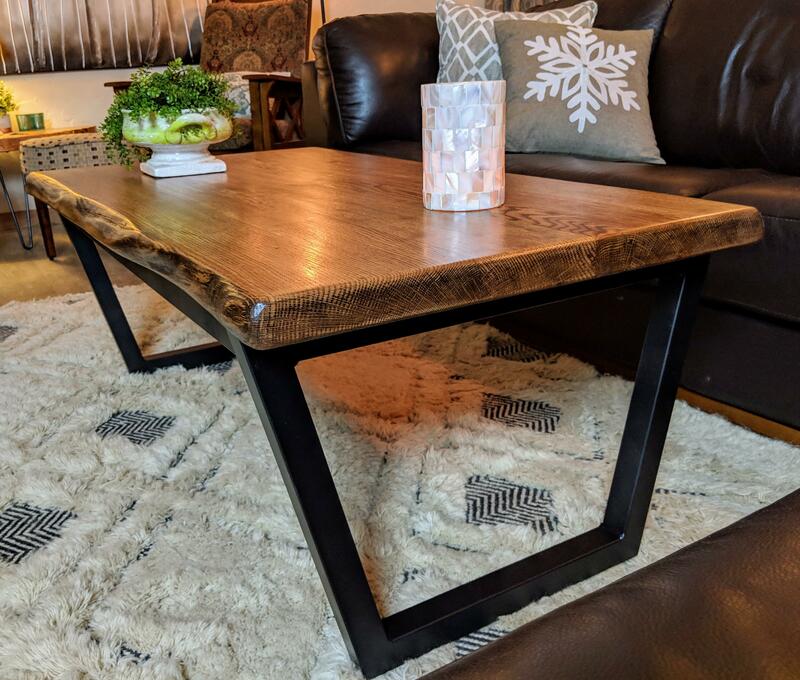 26" x 48" x 18"